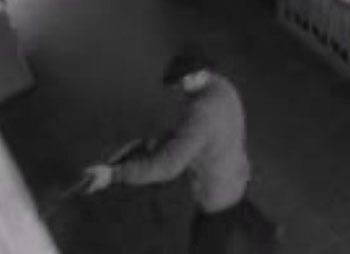 Security camera screenshot showing gunman firing at victims. At around 3:50 pm on Saturday, May 24, a man dressed in a blue sweater and baseball cap walked casually into the Jewish Museum in Brussels, Belgium. Pulling a Kalashnikov rifle from a black bag, he shot and killed four people– an Israeli couple, a French national waiting to enter the museum and a Belgian museum volunteer. He then nonchalantly walked away. By the following Saturday, French authorities in Marseille had arrested 29-year-old Mehdi Nemmouche while performing a routine customs check at the local bus station. Nemmouche, who boarded the bus in Amsterdam, had recently returned to his native France from Syria, where he is believed to have fought alongside the extremist Islamic State of Iraq and the Levant (ISIL) group. The killings bear strong resemblance to a string of murders carried out by French-Algerian Mohammed Merah in Toulouse just two years ago. Nemmouche's calm demeanor after the shooting closely parallels that of Mohammed Bouyeri, the Dutch-Moroccan Muslim who stabbed and shot filmmaker Theo van Gogh on an Amsterdam street in 2004. And most notably, Nemmouche allegedly used a Kalashnikov, the weapon of choice among Western Muslims who join Syrian rebel forces. A Kalashnikov, along with another gun, and a video claiming credit for the murders, were found in Nemmouche's luggage at the time of his arrest. The May 24 murders have brought long-overdue focus to the situation in Belgium, where radical Islam has long been spilling poison on its soil. And the problem is not just about the strength of Sharia4Belgium, one of the strongest Sharia4 organizations seeking to install Sharia law in European countries; nor is it about the estimated 3000 European Muslims who have joined the Syrian rebels. The problems began much earlier and have been growing more incendiary by the year. On the afternoon of 9/11/2001, for instance, controversial activist Dyab Abou Jahjah, a Lebanese-born Belgian with alleged ties to Hezbollah, celebrated the attacks on New York's World Trade Center with friends. Jahjah, who also founded the now nascent Arab-European League ("AEL"), a political group that sought to combine democracy with Sharia in Europe, described the day in his autobiography, writing: "We sat as if hypnotized by the radio, and heard that another plane was missing, maybe two. And that the Pentagon had been hit. We couldn't hold our joy, and laughed together." Jahjah was arrested for inciting riots in 2002; in 2009, AEL protests in Antwerp's Jewish quarter left many Jews afraid to leave their homes. Soon after, he returned to his native Lebanon. This past January Jahjah made his way back to Belgium where he has been actively contributing to the political dialogue, engaging in debates and speeches and penning a column for De Standaard. At the same time, he continues to post veiled anti-Semitic remarks on his Twitter feed (@aboujahjah) and elsewhere. Yet little of this situation has been noted in the international press, even in discussing the attacks of May 24. No one seems to have noticed, say, the migration of Jews from Brussels' center as Muslim immigrants move in, or – more significantly – the increasing number of Jews who have emigrated to Israel, citing anti-Semitism at home. In fact, this development is true elsewhere in Europe as well, where, as the Deutsche Wirtschaft observed in 2011, "Particularly when Jews are recognizable, such as by wearing a yarmulke, they cannot show themselves in certain neighborhoods." Little attention has been paid, either, to a 2013 European report in which Belgium scored the second highest percentage of anti-Semitic attacks, the majority, though not all, of which were at the hands of Muslims, and in which 88 percent of Belgian Jews said that anti-Semitism had increased greatly in the previous five years. This could explain why even top Belgian officials were woefully unprepared for what took place last Saturday at the museum; as former Brussels Police Commissioner Raphael Vandenbergh wrote me in an e-mail, "we never thought such a terrorist attack would be possible in Belgium." That the accused is in fact French suggests, too, that the terror threat is in no way limited to Belgian borders – as the 2011 massacre of children in Toulouse already showed. Indeed, the French have had their share of threats, ranging from the fire-bombing of the offices of Charlie Hebdo in response to a published satirical cartoon, to the bombing of a kosher grocery just outside Paris. A year ago, members of a suspected Chechnyan terror cell were also arrested in various locations surrounding the French capital. In fact, Nemmouche himself was on the French officials' radar, having been previously arrested for armed robbery, and because he was known to have fought alongside jihadist groups in Syria. And yet, he still managed to enter Belgium, walk into a Jewish museum with guns, and use them. There is an even more tragic irony to this story: just two days after the Belgian attacks – and a day after a similar attack in a town outside of Paris -- Dutch officials publicized a new report on local and European intelligence, showing that America's controversial PRISM eavesdropping program abroad – the one that has since been suspended after being leaked by former NSA employee Edward Snowden -- helped foil 26 terrorist attacks across Europe. Very possibly, that same program, were it not for Mr. Snowden, might have prevented the Brussels attack of May 24th. And the next one. And the next one, and the next - whoever may commit them. Wherever they may be. I totally disagree with your conclusion. The PRISM program as well as the NSA evesdropping on private citizens throughout the World has made world citizens quite weary of intelligence and has caused more harm than anything...Nations have since years immemorial used economic spies as well as spies to figure out what enemies are trying to do. Your comment basically says that PRISM and other programs ought to be continued. Don't worry...they are being continued...national security of each country is a priority. It is a good thing that SNOWDEN did open up to make World citizens aware.